Central Park can surprise even lifelong New Yorkers with secluded spots and enthralling secrets. Next time you’re going for a stroll in the Ramble or running near the Reservoir, remember these fascinating stories. 1. Before the creation of Central Park, the Loch in the North Woods provided fresh drinking water to passers-by. Between Huddlestone Arch and a nearby cascade, you’ll find an eyebolt attached to a large rock. Attached to this bolt by chain was a water ladle that collected water for bystanders in the 1800s. The ladle, now kept at the Charles A. Dana Discovery Center, was rediscovered in the early 1990s when the Conservancy was restoring the area. Learn more about this area’s history on our North Woods Tour. 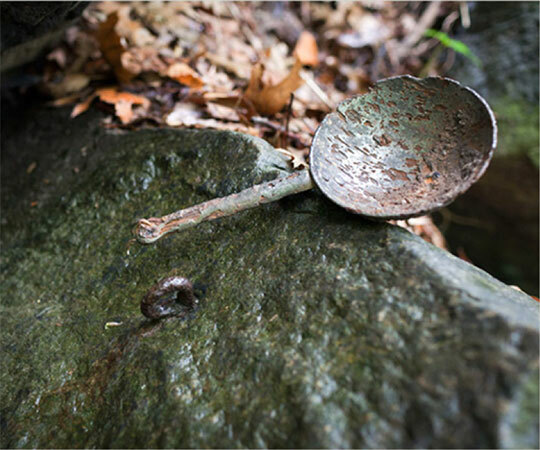 In the 1800s, this iron ladle, now kept at the Charles A. Dana Discovery Center, was attached to this eyebolt and helped collect water for bystanders in the present-day North Woods. 3. Central Park contains a little-known nod to Fred Lebow, creator of the New York City Marathon. Look for a bronze statue of Lebow staring at his stopwatch at Engineers’ Gate at Fifth Avenue and 90th Street (where runners enter the Park on the day of the marathon). The statue is moved to the finish line of the marathon each year. 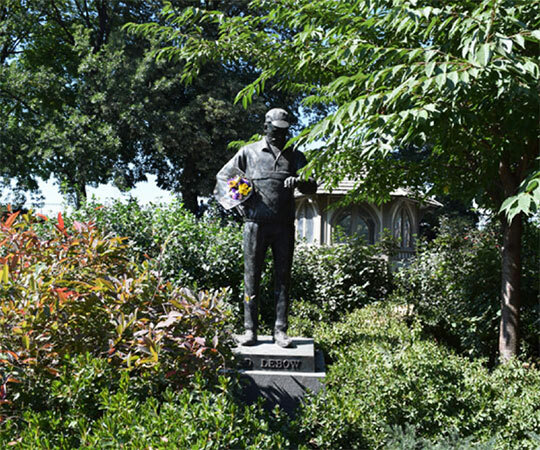 A bronze statue of Fred Lebow, creator of the New York City Marathon, stands on the east side of the Reservoir most of the year, but is moved to the marathon finish line each race day. 4. If you’re lost in the Park, lampposts can help you find your way. The base of every lamppost in Central Park contains four numbers — the first two numbers indicate the nearest street (“80” would mean 80th Street) and the last two numbers designate whether you’re on the west or east side (odd number means west, even number means east). Now you can navigate without a map or a smartphone! 5. A cannon in Central Park’s north end was loaded for many years. With expansive views that can still be experienced today, it’s clear why the site of Fort Clinton was an important strategic position during the Revolutionary War and the War of 1812. It’s home to a cannon (recovered from the sunken British warship H.M.S. Hussar) that an anonymous donor gave to the Park in 1865. When Conservancy staff cleaned the cannon in 2013, they discovered it loaded with a cannonball and gunpowder. 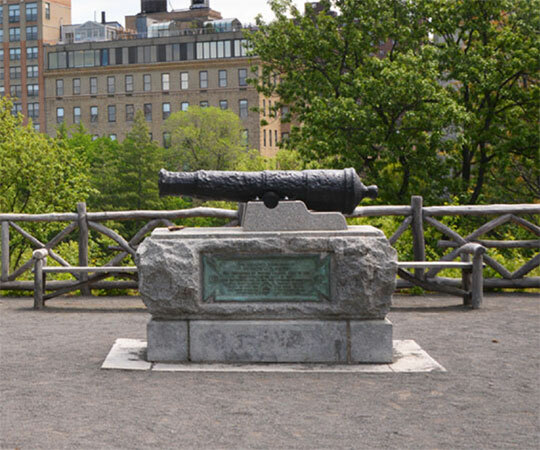 Now plugged and safe, the cannon serves as a reminder that Central Park’s history is older than the Park itself. Recovered from the sunken British warship H.M.S. Hussar, this cannon at the site of Fort Clinton was loaded with a cannonball and gunpowder until 2013. 6. You can visit where Kingsbridge Road, one of New York City’s earliest roads, passed through what is now Central Park. Also known as the Eastern Post Road, it served as the main passage through Manhattan to the Bronx before the current grid of streets was laid out. McGowan’s Pass refers to the area where Kingsbridge Road descended through a small valley in the Park’s north end. The presence of the road and hilly topography made this area ideal for military defense — first during the Revolutionary War for the British, and again during the War of 1812 for the Americans. Decades later, this area would become Central Park. 7. A spot in the Ramble features several bird feeders. Located along the Atlantic Flyway, Central Park welcomes more than 270 migrating bird species each year. One of the best spots to see and identify birds is the Ramble, especially an area east of Azalea Pond where a handful of bird feeders make it a fun location to watch them gather. Did you know there were originally many rustic birdhouses and beehives scattered throughout the Park? 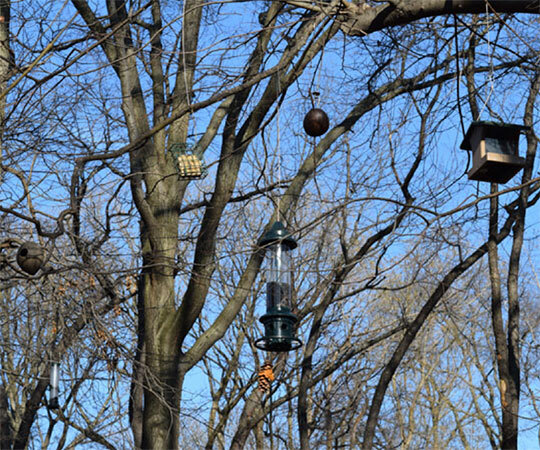 Central Park is a popular location for bird-watching — especially in the Ramble, where these bird feeders draw crowds looking to catch a glimpse of the diverse wildlife. 8. Five maple trees in Central Park represent the five boroughs. Andrew Haswell Green, the “Father of Greater New York,” was an instrumental figure in the creation of Central Park, in addition to helping unify the five boroughs into the greater New York City that we know today. (Historian Kenneth T. Jackson calls him “arguably the most important leader in Gotham’s long history.”) Green is honored with a granite bench, on the east side near 105th Street, that is surrounded by five red maple trees representing the five boroughs. The trees were planted in 1998, the year of New York City’s centennial.